By Cliff Kincaid: A nice-sounding bill called the “Global Poverty Act,” sponsored by Democratic presidential candidate and Senator Barack Obama, is up for a Senate vote on Thursday and could result in the imposition of a global tax on the United States. 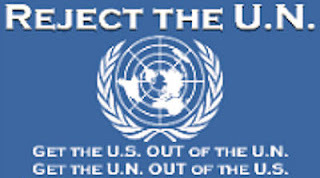 The bill, which has the support of many liberal religious groups, makes levels of U.S. foreign aid spending subservient to the dictates of the United Nations. Senator Joe Biden, chairman of the Senate Foreign Relations Committee . . . is trying to rush Obama’s “Global Poverty Act” (S.2433) through his committee. The legislation would commit the U.S. to spending 0.7 percent of gross national product on foreign aid, which amounts to a phenomenal 13-year total of $845 billion over and above what the U.S. already spends. The bill, which is item number four on the committee’s business meeting agenda, passed the House by a voice vote last year because most members didn’t realize what was in it. Congressional sponsors have been careful not to calculate the amount of foreign aid spending that it would require. According to the website of the Senate Foreign Relations Committee, no hearings have been held on the Obama bill in that body. . . .
Jeffrey Sachs, who runs the U.N.’s “Millennium Project,” says that the U.N. plan to force the U.S. to pay 0.7 percent of GNP in increased foreign aid spending would add $65 billion a year to what the U.S. already spends. Over a 13-year period, from 2002, when the U.N.’s Financing for Development conference was held, to the target year of 2015, when the U.S. is expected to meet the “Millennium Development Goals,” this amounts to $845 billion. And the only way to raise that kind of money, Sachs has written, is through a global tax, preferably on carbon-emitting fossil fuels. . . . It appears the Senate version is being pushed not only by Biden and Obama, a member of the committee, but Lugar, the ranking Republican member. Lugar has worked with Obama in the past to promote more foreign aid for Russia, supposedly to stem nuclear proliferation, and has become Obama’s mentor. Like Biden, Lugar is a globalist. They have both promoted passage of the U.N.’s Law of the Sea Treaty, for example. . . . [Read More] Contact your senators! Tags: Barack Obama, Cliff Kincaid, Global tax, UN, US Senate To share or post to your site, click on "Post Link". Please mention / link to the ARRA News Service. Thanks!